Roles of microRNAs (miRNAs) and short interfering RNAs (siRNAs) in biotic stress responses, e.g., viral infection, have been demonstrated in plants by many studies. Tomato yellow leaf curl China virus (TYLCCNV) is a monopartite begomovirus that can systemically infect Solanaceae plants, and induces leaf curling, yellowing and enation symptoms when co-inoculated with a betasatellite (TYLCCNB). The released genome sequence of Nicotiana benthamiana provides an opportunity to identify miRNAs and siRNAs responsive to begomovirus-associated betasatellite in N. benthamiana. miRNAs were identified in three small RNA libraries generated using RNA isolated from N. benthamiana plants systemically infected with TYLCCNV (Y10A) alone, co-infected with Y10A and its betasatellite TYLCCNB (Y10β) or a TYLCCNB mutant (Y10mβ) that contains a mutated βC1, the sole betasatellite-encoded protein. A total of 196 conserved miRNAs from 38 families and 197 novel miRNAs from 160 families were identified. Northern blot analysis confirmed that expression of species-specific miRNAs was much lower than that of conserved miRNAs. Several conserved and novel miRNAs were found to be responsive to co-infection of Y10A and Y10β but not to co-infection of Y10A and Y10mβ, suggesting that these miRNAs might play a role unique to interaction between Y10β and N. benthamiana. Additionally, we identified miRNAs that can trigger the production of phased secondary siRNAs (phasiRNAs). 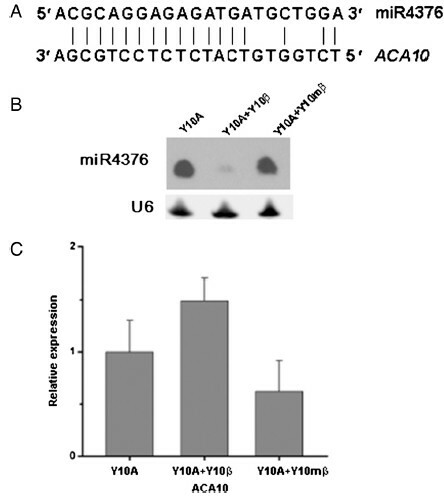 Identification of miRNAs with differential expression profiles in N. benthamiana co-infected with Y10A and Y10β and co-infected with Y10A and Y10mβ indicates that these miRNAs are betasatellite-responsive. Our result also suggested a potential role of miRNA-mediated production of phasiRNAs in interaction between begomovirus and N. benthamiana. Endogenous small RNAs, which consist of microRNAs (miRNAs) and short interfering RNAs (siRNAs), are important regulators of organ development, stress responses and genomic stability in plants [1, 2]. Roles of miRNAs and siRNAs in biotic and abiotic stress responses, e.g., viral infection, have been demonstrated in plants by many studies . miRNAs downregulated or upregulated in plants infected with virus, such as miR156, miR158, miR159, miR160, miR164, miR168, miR171, miR172, miR319, miR398 and miR1885, might play a role in interactions between virus and plants [3–10]. Plant endogenous siRNA-mediated gene silencing was found to be involved in plant biotic stress, for example, bacteria-induced nat-siRNAATGB2 regulates R-gene mediated plant immunity . Rice stripe virus infection enhanced the accumulation of phased miRNAs from a particular precursor . Plant miRNAs can trigger the production of phased secondary siRNAs (phasiRNAs) from either non-coding (e.g., TAS) or protein-coding genes (e.g. NBS-LRR genes). Trans-acting siRNAs (tasiRNAs) are distinctive siRNAs, which are generated from TAS transcripts in 21-nucleotide (nt) phases in relative to the miRNA cleavage site. They act in trans to regulate gene expression at the posttranscriptional level. Biogenesis of tasiRNAs is triggered by interaction of miRNA(s) at single or dual ends of the precursor TAS transcripts . There are at least eight TAS loci that belong to four TAS families (TAS1–TAS4) in Arabidopsis and four TAS3 loci have been identified in rice [13–15]. Recent studies demonstrated that plant genomes are rich in phased siRNA (phasiRNA)-producing loci, or PHAS genes [16–19], and may harbor hundreds of these loci in protein-coding genes [15, 20–23]. For example, a batch of 21-nt and 24-nt phasiRNAs triggered by miR2118 and miR2275, respectively, were identified in the developing inflorescence of rice . Biogenesis of phasiRNAs and their roles in posttranscriptional regulation have been well discussed in a recent review . Geminiviruses are a group of single-stranded DNA viruses that cause devastating economic losses worldwide. Four genera (Mastrevirus, Begomovirus, Curtovirus and Topocuvirus) have been classified according to genome organizations, host ranges and transmission vectors, with Begomovirus being the most numerous and geographically wide-spread . Begomoviruses have either monopartite or bipartite genomes. In the past decade, several studies have shown that many monopartite begomoviruses have acquired a betasatellite, formerly called DNAβ, and βC1, the sole betasatellite-encoded protein, plays essential roles in symptom induction, in suppression of transcriptional and posttranscriptional gene silencing, and also involves in suppression of selected jasmonic acid responses [25–29]. Tomato yellow leaf curl China virus (TYLCCNV) is a monopartite begomovirus associated with a betasatellite (TYLCCNB). TYLCCNV alone produced asymptomatic infection in Nicotiana benthamiana and tomato plants. TYLCCNB is essential for induction of leaf curl symptoms in these host plants when co-infected with TYLCCNV. TYLCCNB mutants unable to express the βC1 protein abolished its ability to induce typical symptoms in plants when co-inoculated with TYLCCNV . In our previous study, we identified TYLCCNV- and TYLCCNB-derived siRNAs by deep sequencing small RNAs from systemically infected N. benthamiana plant leaves and found that viral transcript might act as RNA dependent RNA polymerase (RDR) substrates resulting in secondary siRNA production . However, plant miRNA profiles regulated by TYLCCNB remain largely unknown. Recent release of the draft genome sequence of N. benthamiana  provides an opportunity to identify miRNAs and siRNAs from the host plant and investigate expression changes of host miRNAs and siRNAs in response to viral infection. In this study, we identified N. benthamiana miRNAs based on the draft genome and our previously generated small RNA datasets using N. benthamiana plants infected with begomovirus, and found a number of miRNAs, including a few putative phasiRNA triggers, were responsive to co-infection of TYLCCNV and TYLCCNB but not to TYLCCNV and a mutated TYLCCNB in N. benthamiana. The N. benthamiana plant leaves systemically infected with TYLCCNV (Y10A) alone (P1), or co-infected with TYLCCNV and its betasatellite TYLCCNB (Y10β; P2) or a TYLCCNB mutant (Y10mβ; P3) were harvested for RNA extraction and small RNA sequencing . In the 12.2 million small RNA reads or 7.3 million unique reads from N. benthamiana leaves, a total of 7.2 million reads or 5.6 million unique reads could be mapped to the N. benthamiana genome (Additional file 1: Table S1). Using the approach described in the Methods and based on BLAST search against the public miRNA database (miRBase, Release 19), we identified a total of 196 conserved miRNAs from 38 families in the N. benthamiana genome (Additional file 2: Table S2). Meanwhile, a total of 197 novel miRNAs from 160 families were also identified (Additional file 3: Table S3). A further search (BLASTn with < 1e-3) of these novel mature miRNA sequences against the small RNA populations from N. tabacum recently generated by us  showed that 42 novel N. benthamiana miRNAs is conserved in N. tabacum. Target prediction indicated 147 (91.9%) novel miRNAs had at least one potential target (Additional file 3: Table S3). 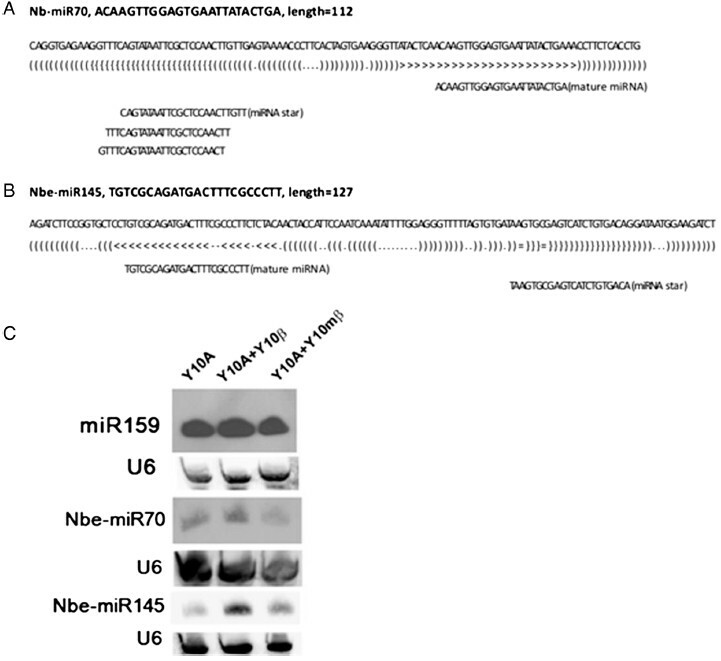 Expression of two novel miRNAs, Nbe-miR70 and Nbe-miR145, together with the conserved miR159 could be detected by Northern blot, although the expression levels of the two novel miRNAs were much lower than that of miR159 (Figure 1), consistent with the well known phenomenon for lowly expressed non-conserved miRNAs. Novel Nicotiana benthamiana miRNAs responsive to TYLCCNV/TYLCCNB infection. (A) and (B) Precursors of two novel N. benthamiana miRNAs, Nbe-miR70 and Nbe-miR145. (C) Northern blot analysis of expression of Nbe-miR70 and Nbe-miR145 in N. benthamiana plants infected by TYLCCNV alone (Y10A or P1), together with TYLCCNB (Y10β or P2) or mutated TYLCCNB (Y10mβ or P3). Conserved miR159 was used as a miRNA control. Based on the draft genome of N. benthamiana and the algorithm described by Howell et al. (see Methods for the details), we found that over thousands of loci were able to generate 21-nt and 24-nt phasiRNAs (phase score > 1.4). Of these phasiRNA loci, miRNA binding site(s) could be predicted in at least 157 of 21-nt and 296 of 24-nt phasiRNA loci (within the region with phased small RNA reads and their two flanking 200-nt regions), suggesting that these miRNAs are putative phasiRNA triggers in N. benthamiana (Additional file 4: Table S4). For these potential phasiRNA triggers or phase registers, their putative cleavage sites (between positions 10 and 11 in the predicted miRNA target sites) were all located at a phase position. A total of 62 conserved miRNAs from 24 families which could bind to PHAS loci were found, e.g., miR156 and miR482 (Table 1). More than 300 PHAS loci seem to be triggered by N. benthamiana or Nicotiana-specific miRNAs, such as Nbe-miR2 (Additional file 4: Table S4). One example was shown in Figure 2, in which Nbe-miR113, a novel N. benthamiana miRNA, was predicted to trigger production of 21-nt phased small RNAs in a N. benthamiana gene. In addition to non-coding transcript, such as TAS genes, many protein-coding genes were also identified as miRNA-triggered PHAS loci in N. benthamiana (Additional file 4: Table S4), including some loci targeted by conserved miRNAs, such as miR156 and miR482 (Table 1), which have been shown to generate phasiRNAs from protein-coding genes in several recent studies [15, 20–23, 33, 34]. When an extremely strict phase score (> 20) was applied, 1 and 13 loci generating 21-nt and 24-nt phasiRNAs, respectively, could still be identified. References for virus response and PHAS by previous studies were listed. A detailed list was shown as Additional file 5: Table S5. *Fold of P2/P1; #ND: not determined. Nbe-miR113 triggered phasiRNA production in an NBS-LRR gene (Niben044Scf0002438) in N. benthamiana . (A) The alignment between miRNA and its target. Two dots indicate matches. (B) The small RNA abundances and phasing score distributions across Niben044Scf0002438. Previous reports showed that some miRNAs were differentially expressed after virus infection [8, 10]. In this study, our focus was on the miRNAs responsive to betasatellite (TYLCCNB) associated with TYLCCNV, i.e. those with a similar expression level in plants infected with TYLCCNV (Y10A) and co-infected with TYLCCNV and a mutated TYLCCNB (i.e. Y10A + Y10mβ) but with an up- or down-regulated expression level in plants co-infected with TYLCCNV and a functional TYLCCNB (i.e. Y10A + Y10β). With the criteria of 1.7-fold changes in Y10A + Y10β versus both Y10A and Y10A + Y10mβ and RPM (reads per million) ≥ 10 in at least one of the three samples, we found that among the conserved miRNAs, miR160, miR164, miR397 and miR398 were up-regulated whereas miR169, miR391 and miR827 were down-regulated in responsive to TYLCCNB, and that among the novel miRNAs, Nbe-miR8, Nbe-miR70, Nbe-miR107, Nbe-miR124 and Nbe-miR134 were up-regulated whereas Nbe-miR2, Nbe-miR3 and Nbe-miR142 were down-regulated in responsive to TYLCCNB (Table 1; Additional file 5: Table S5). Up-regulation of Nbe-miR70 was confirmed by northern blot (Figure 1). In addition, down-regulation of miR4376 observed in plants co-infected with TYLCCNV and a functional TYLCCNB, i.e. Y10A + Y10β, was also confirmed by the northern blot results; consequently, an up-regulation of its target gene ACA10 (autoinhibited Ca 2+ -ATPase 10) was detected by RT-qPCR (Figure 3; Additional file 5: Table S5). 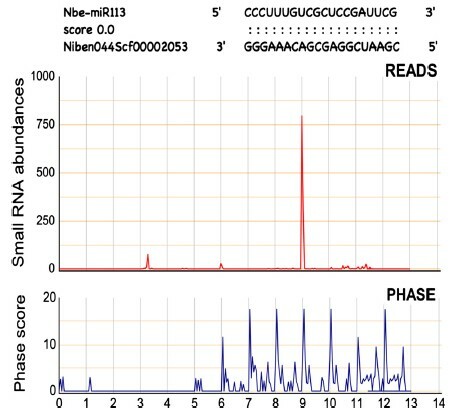 Expression of miR4376 and its target ( ACA10 ) mRNA in three different cDNA libraries of N. benthamiana . (A) Alignment of miR4376 with its target ACA10. (B) Northern blotting of miR4376 in N. benthamiana plants infected by TYLCCNV alone (Y10A or P1), together with TYLCCNB (Y10β or P2) or mutated TYLCCNB (Y10mβ or P3). (C) Expression of ACA10 in various treatments measured by Real-time qPCR. Error bars represent standard deviation determined with three biological replicates. The majority of miRNAs had a similar expression level in N. benthamiana plants systemically infected with TYLCCNV alone (P1) and co-infected with TYLCCNV and a mutant betasatellite TYLCCNB (P3) (Additional file 5: Table S5), confirming an un-functional βC1 in the mutated TYLCCNB. This result also suggests that the aforementioned miRNAs that were responsive to betasatellite most likely indeed have a role in interaction between begomovirus and N. benthamiana. Interestingly, some of the differentially expressed miRNAs, such as miR391, miR397 and miR398, were putative triggers of phasiRNA production (Table 1). The involvement of miRNAs in diverse biotic responses (viral, bacterial and fungal) has been demonstrated by recent studies . Our study confirmed that the expression of host miRNAs (such as miR391, miR397 and miR398) is affected in response to betasatellite. There are at least two different kinds of miRNAs: one is suppressed by the viral suppressors of RNA silencing (VSRs) while another is involved in anti-pathogen (virus) by regulating plant innate immune receptors or hormone signaling pathway. Viral encoded proteins interfere with host RNAi pathways and thus distort the normal cellular activities . They can bind directly to host miRNAs and therefore making non-function of RNA-induced silencing complex (RISC). miRNAs are key regulatory molecules in diverse biological processes in plants, for example, miR164, miR159/319 for leaf development . Apparently, the typical leaf curl symptoms in N. benthamiana induced by co-infection of TYLCCNV and its betasatellite TYLCCNB could be caused by deregulation of those differentially accumulated miRNAs in responsive to betasatellite (Table 1). The differentially down-regulated miR4376 in N. benthamiana plants co-infected with TYLCCNV and TYLCCNB was predicted to target an ACA gene and could also be involved in leaf development, because a recent study showed that miR4376 targets ACA10 gene and plays a critical role in tomato reproductive growth . In addition, the miRNAs, such as miR160, that were up-regulated in plants co-infected with TYLCCNV and a mutated TYLCCNB but the up-regulation level was much smaller than that in plants co-infected with TYLCCNV and a functional TYLCCNB could also have a role in response to betasatellite. Recent studies demonstrated a role of miRNA-mediated phasiRNA pathway in diverse biological processes, including pathogen resistance [15, 20–23, 34]. For example, miR482/2118-mediated cleavage of disease resistance NBS-LRR genes not only plays an important role in non-race specific disease resistance but triggers production of phased small RNAs that are able to regulate the expression of their targets in trans [15, 21]. Upon pathogen infection, the expression level of miR482 was down-regulated and consequently its targets, NBS-LRR genes, were up-regulated [21, 34]. miR482/2118 belongs to a specific type of miRNA that generated from pre-miRNAs containing asymmetric bulges in the miRNA/miRNA* duplex and has been demonstrated to be the trigger for production of phased 21-nt secondary small RNAs from their target transcripts through the RDR6/DCL4 pathway . Therefore, miR482/2118-mediated cleavage of target disease resistance genes is expected to cause both decay of their target mRNAs and production of phased secondary small RNAs from the target genes, such as shown in tomato, cotton and Medicago truncatula [15, 21, 34]. Furthermore, at least one of the secondary small RNAs generated from a miR482 targeted NBS-LRR gene has been shown to target mRNA encoding another defense-related protein , indicating that the secondary small RNAs generated from protein-coding genes can behave like TAS loci in Arabidopsis . In this study, the expression level of miR482 was up-regulated in N. benthamiana plants co-infected with TYLCCNV and TYLCCNB compared to plants infected with TYLCCNV alone, which is in contrast with previous observation. Meanwhile, this up-regulation of miR482 was also observed in plants co-infected with TYLCCNV and a mutated TYLCCNB (Additional file 5: Table S5). Therefore, more investigation is required to understand the function of miR482 in response to betasatellite. In addition to miR482, several other betasatellite-responsive miRNAs, such as miR397 and miR398, were potential triggers of phasiRNAs (Additional file 4: Table S4), suggesting that both these miRNAs and the phasiRNAs generated from targets of these miRNAs could play a role in interaction between begomovirus and N. benthamiana. A total of 196 conserved miRNAs and 197 novel miRNAs were found in the genome of N. benthamiana. Among them, several showed a differential expression pattern in N. benthamiana plants co-infected with TYLCCNV and TYLCCNB and co-infected with TYLCCNV and a mutated TYLCCNB, suggesting a role of these miRNAs in interaction between the betasatellite associated with begomovirus and N. benthamiana plants. In addition, our study showed that several of these differentially expressed miRNAs were potential triggers for production of phasiRNAs. Three sets of small RNA populations (accession number: GSE26368) from N. benthamiana were generated in our previous study using high-throughput sequencing technology . In short, N. benthamiana plant leaves systemically infected with Tomato yellow leaf curl China virus (TYLCCNV) alone (P1), co-infected with TYLCCNV and its associated betasatellite (TYLCCNB) (P2) or mutated TYLCCNB (P3) were sampled and used in sRNA cDNA library construction. The sRNA libraries were sequenced using high-throughput sequencing technology. Draft genomic sequences of N. benthamiana were downloaded from http://solgenomics.net (Niben.genome.v0.4.4) . (where n = number of phase cycle positions occupied by at least one small RNA read within an eight-cycle window, and k = the total number of reads for all small RNAs with consolidated start coordinates in a given phase within an eight-cycle window) described by Howell et al. and our previous studies [19, 32]. miRNAs that bind to PHAS loci within the regions generating phased small RNA reads or their flanking 200-nt regions were considered as putative phasiRNA triggers. In these PHAS loci, the putative miRNA cleavage sites (between positions 10 and 11 in the predicted miRNA target sites) were always found at a position corresponding to a phase register. Total RNA was extracted from systemically-infected N. benthamiana leaves using Trizol Reagents following the manufacturer’s instructions (Invitrogen, Carlsbad, CA). A total of 15–30 μg low molecular weight (LMW) RNA, isolated by Polyethyleneglycol (molecular weight 8000, PEG8000) and NaCl , was separated on a denaturing 15% polyacrylamide denaturing gels and transferred to Hybond N+ membrane. After being cross-linked by UV radiation, the Hybond membrane was hybridized with biotin-labeled DNA probes complementary to candidate miRNA sequences at 42°C overnight. Post hybridization washes were performed twice using 1X SSC and 0.5% sodium dodecyl sulfate (SDS) at 42°C for 15 min. Hybridization signals were detected with stabilized streptavidin-horseradish peroxidase conjugate supplemented in Chemiluminescent Nucleic Acid Detection Module (Thermo, Pierce) according to the manufacturer’s instructions. To confirm equal loading of the gels, U6 was selected as internal control and blots were also hybridized with a DNA probe complementary to U6. One μg of DNase I-treated total RNA was reverse transcribed using AMV Reverse Transcriptase (Takara, Dalian, China) following the manufacturer’s instructions. Quantitative real-time PCR was performed using SYBR Green PCR supermix (Roche, Mannheim, Germany) in a Lightcycler® Real-time PCR system (Roche) as described . Three independent biological replicates were conducted and the relative expressions of miRNA target gene were normalized using the CT values obtained for the internal control GADPH. Analysis was carried out using Lightcycler® 480 software supplemented by the manufacturer (Roche). We thank Dr Qian-Hao Zhu (CSIRO Plant Industry, Australia) for critical reading of the manuscript. This work was supported by National Natural Science Foundation of China (31200117) and Yunnan Provincial Tobacco Company (08A05/2011YN04). BX and LF conceived the study. XY performed experimental validation of miRNAs and RT-qPCR analysis. C-Y Y, YL, CY and YW identified miRNAs and phasiRNAs and performed expression analysis. LF, BX, XL, and YL discussed the data. LF, XY and C-Y Y wrote the manuscript. All authors read and approved the final manuscript.